There are regular charcoal barbecues, there are gas BBQs and there are electrical grills. Charcoal BBQs are still popular, but may be prohibited on balconies and near houses due to the risk of fire. Electricity and gas barbecues may on one hand be easier and safer to use, but does not create the smoky barbecue flavour many BBQ enthusiasts desire. 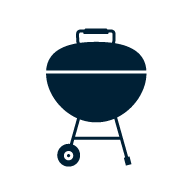 Compare prices on BBQs and grills from manufacturers such as Weber, Landmann, Breville, Futur and many more here.